S'mores are a favorite. And, this version doesn't require the fire! These pudding bars are a decadent treat that also provides calcium and vitamin D.
To cut back on the sugar and calories, you can skip the marshmallows and still enjoy the deliciousness of chocolate with graham crackers! 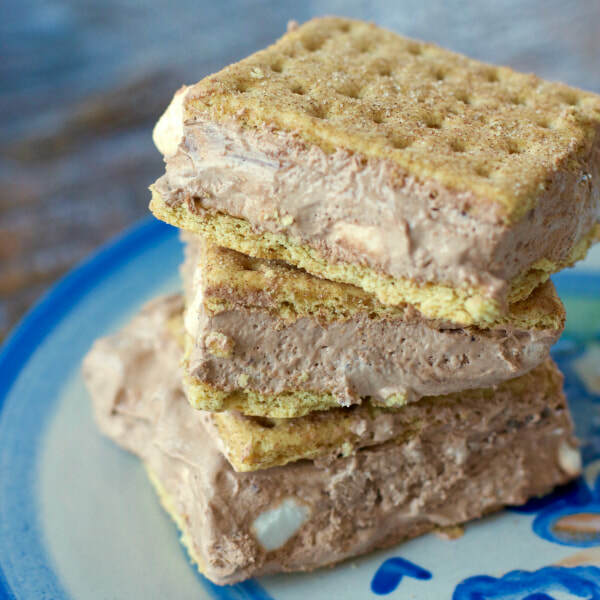 And, if you want a fruity version of this classic, try Strawberry S'mores. In a large bowl, whisk together milk and pudding mix until well combined. Stir in whipped topping and marshmallows. In a 9 x 13 inch glass baking dish, lay out half the graham crackers. Spread pudding mixture evenly over graham crackers. Top with remaining graham crackers, forming sandwiches, and lightly press together. Freeze for 4-6 hours, then cut into individual squares and wrap each one individually; return to freezer until ready to serve. *Nutrition information includes miniature marshmallows in analysis. Note: These will keep for up to 2 weeks in the freezer.